There’s nothing I love better than soaking in a gloriously scented hot bath on a chilly day; it soothes my stiff joints and eases the pain in a sweet massage of heat and aromatherapy. Gentle steam glides through the room, playing shadow puppets with the dancing flame of a candle; I usually have a book and an occasional glass of wine by my side for that touch of indulgence. This was the only type of bath to which I was accustomed, until my first day of physiotherapy, where I was introduced to a different sort of bath. I’d had physiotherapy in the past, mainly for injuries from car accidents, sports injuries, and dance injuries. But this was a different kind of therapy, designed to teach me how to manage inflamed joints without damaging them in the face of arthritis. A lovely young woman, with round coffee eyes, entered the waiting room and introduced herself as my therapist. I followed her through a short fat corridor that blossomed into a large area with an assortment of exercise equipment, mats and large rolling balls. Beyond this was another area divided into individual rooms by white curtains. She pulled back one of the curtains, revealing an airy space that contained a small square table, a chair and a folding bed. I sat on the bed while she reviewed the goals we discussed at our first meeting with the occupational therapist. She asked how I was feeling and I replied, “Okay, but my hands are pretty puffy this morning.” She placed a pillow across my lap and asked me to put my hands top so she could examine them. After a bit of bending and prodding, she excused herself, leaving me to look over a couple of sheets with illustrations of the exercises I would learn throughout our sessions. I was trying to make sense of the stick-figured drawings when she returned with a rolling table. On top were two bowls of water separated by a white towel in the middle. 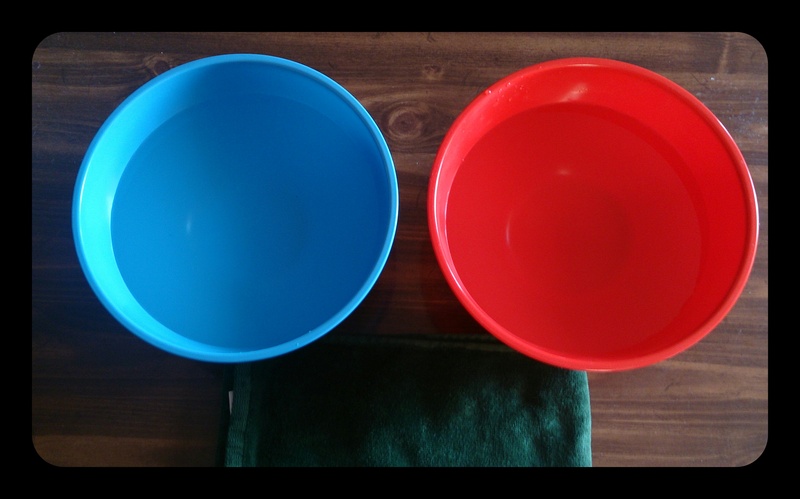 One bowl had cool water, the other contained mildly hot water. The questioning look on my face was directly answered – this is a contrast bath for the hands. The technique was simple – immerse my hands in the cold water, leave them submerged for about 30 seconds, and then switch over and dip them into the hot water, submerging them for about half the amount of time. She suggested anywhere from 30 seconds to a minute for each bowl before switching. The rapid change from hot to cold opens the small arteries in the hands, encouraging blood flow, reducing swelling and helps to increase mobility. The whole process could take anywhere from ten to fifteen minutes. While my hands were soaking, she chatted about exercises she would be teaching me in our time together. There would be upper body exercises, hand exercises, strengthening exercises for the core, legs, knees, SI joints, ankles and feet. I methodically moved my hands between cold and hot water while she talked. After her discussion, I removed my hands from the water and was I was amazed at how light my hands felt. The swollen thickness had melted away. Such a simple concept, it took almost no time at all, and was so easy to prepare. How had I never heard of this before? I was elated. I was now armed with a simple technique to help me conquer one of the ruthless ploys of old lady RA. Hi Wren, I too, can’t tolerate cold water; however, I do use ice when my joints are really swollen. My physio suggested about 15-30 seconds of soaking in the cold, and then moving them into the hot water for about the same amount of time. The switching back and forth helps reduce the uncomfortable sting of the cold water. I’ve found the few times I’ve done it so far, it does help with reducing my puffy fingers and encouraging circulation. If nothing else, it certainly feels nice to dip them into the hot water, and sometimes, I keep them there just a little bit longer ;). Hope all is well with you. I’m going to have to try that when my hands are puffy and sore. I wonder if it would work on my wrist? I’m going to have to try that. Thanks for this enlightening post! And what a wonderful gift. It is better than diamonds. How wonderful! Not only an easy, effective treatment but wonderful story telling. I am so glad you found something that is so effective (and shared it with the rest of us)! What a sweet, loving significant other you have. Hope you are doing well and the therapy is bringing you some relief! I love my contrast baths. So far, they are helping to reduce my hand and finger swelling. I was so thrilled to be taught such a simple and effective way, that takes only ten minutes in my day. I also find it somewhat relaxing. Hope all is well with you. Another excellent post! Keep up the artful, informative work. Love it! Thank you 🙂 I do my best to share my experience. Hope you are keeping well. Cheers.